Ibn al-Kattānī was an important physician and scholar of 11th-century Spain, and was in the service of a Spanish vizier about 1002/393. Yet, with the exception of the manuscript now at NLM, his medical writings are lost today and known only through citations by later physicians. The treatise on skin diseaes, Mu‘alajat al-amrāḍ al-khaṭirah al-bādiyah ‘alá al-badan min khārij (The Treatment of Dangerous Diseases Appearing Superficially on the Body), preserved today in NLM MS A 91 item 1, is the only medical writing by Ibn al-Kattānī known to be extant today. Poisonous bites are the subject of much of the treatise. No other copies are recorded. 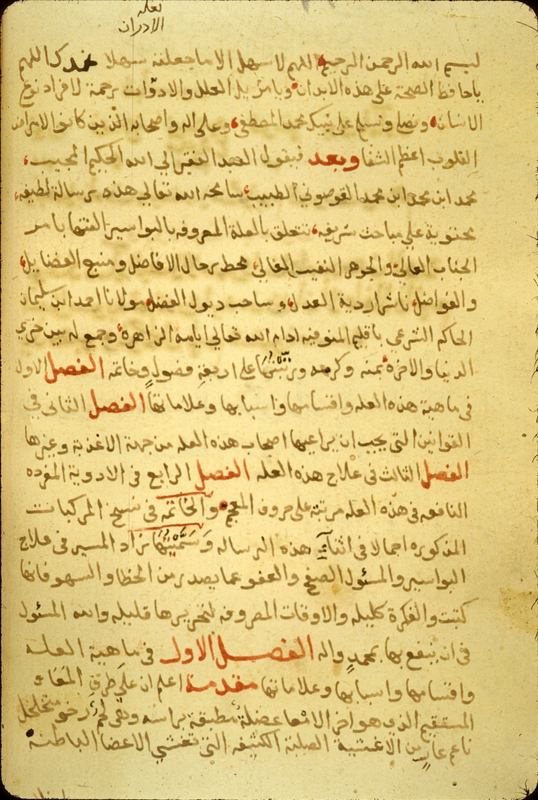 The opening of an important copy of an Arabic treatise on the treatment of skin diseases written by an early 11th-century Spanish physician, Ibn al-Kattānī. The copy, made by one Salīm, is undated, probably 18th-century. Arabic. 44 pages (pp. 1-44 [old 15-58]). Dimensions 21.5 x 15.7 (text area 16.5 x 10.5) cm; 21 lines per page. The title is given on p. 1 [old 15]. The author's name is given p.1 line 1 as: Abī ‘Abd Allāh Muḥammad ibn ḥasan known as (al-ma‘ruf bi-) Ibn Kattānī. His name is clearly stated to be Ibn Kattānī, rather than Ibn Kinānī as stated by Sommer (Schullian/Sommer, Cat. of incun.& MSS., p. 329). The copy is undated and unsigned. It appears to have been made by the same copyist who wrote item 5 in the volume and who signed that item (p. 96 bottom left corner) with the name Salīm. The appearance of the paper, script, and ink suggests a date of the 18th century. The text is written in a medium-small naskh script, with black ink and headings in red. There are catchwords. The same hand transcribed all or most of the items in the volume. The volume has been paginated rather than foliated. The volume has been recently repaginated in Western numerals. There is an early pagination in Arabic numerals which places the numeral 15 on the first page of the present volume, with some mistakes and omissions. Therefore, it is evident that the first 14 pages of the manuscript are now missing. According to this earlier pagination, there are also leaves missing after pp. 44 (old 58), 182 (old 186), 188 (old 194), and 220 (old 227). There are also section numbers (nos. 40-694) in the margins, and this marginal numbering is continuous, unbroken by missing leaves, except at the beginning, indicating that it was written after the missing leaves, except opening leaves, had disappeared. The page references are to the Western pagination, followed by the old pagination. The same paper has been used throughout the volume. It is a thick, glossy, light-beige (darkened near the edges) paper with laid lines, single chain lines, and watermarks. The paper is greatly soiled by thumbing and with grime, and is waterstained near the edges. The edges have been repaired on several leaves. The volume consists of 268 leaves. Item 1 (pp. 1-44) is the item here catalogued. Item 2 (p. 44) untitled and anonymous writing on foodstuffs (MS A 91, item 2); item 3 (p. 45) an untitled and anonymous collection of compound remedies (MS A 91, item 3); item 4 (pp. 46-91) is a therapeutic mujarrabat manual by Muḥammad ibn Khamrah (MS A 91, item 4); item 5 (pp. 91-96) an anonymous treatise titled Risālah fī khawāṣṣ al-panzahr (MS A 91, item 5); item 6 (pp. 97-103) contains recipes (MS A 91, item 6); item 7 (pp. 103-106) is an anonymous discourse titled al-Qawl fī faḍl al-fatīḥah (MS A 91, item 7); item 8 (pp. 106-109) an anonymous essay titled Ṣifat ma‘jūn nāfi‘ lil-ma‘idah (MS A 91, item 8); item 9 (pp. 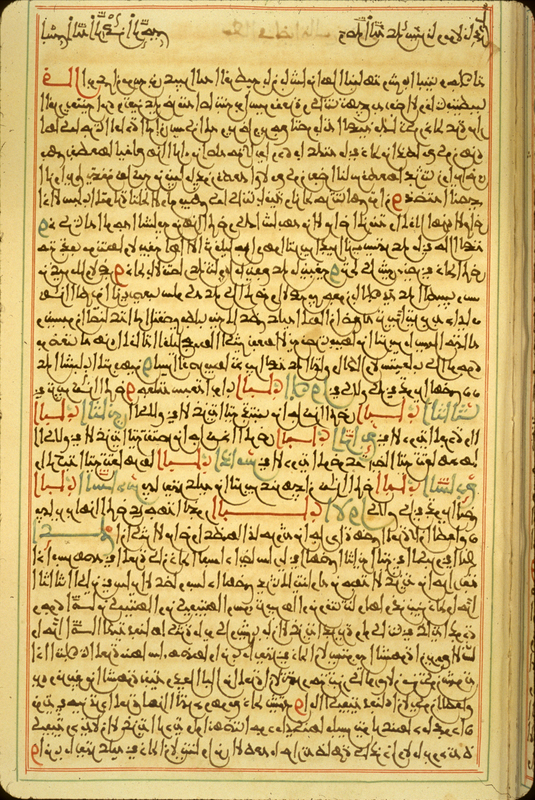 110-119) in an essay on Prophetic traditions by al-Shaykh Abū al-‘Abbās known as Ibn al-Mīlaq, or Ibn Maylaq (MS A 91, item 9); item 10 (pp. 120-182) an anonymous treatise Kitāb al-Khawāṣṣ (MS A 91, item 10); item 11 (pp. 183-188) on medicinal plants, untitled and anonymous (MS A 91, item 11); item 12 (pp. 189-253) on compound remedies (MS A 91, item 12); item 13 (pp. 254-262) is al-Jawhar al-fard fī mufākharat al-narjis wa-al-ward possibly by Abū al-Ḥasan ‘Alī ibn al-Musharraf al-Māridīnī (MS A 91, item 13); and the final item (pp. 262-268) are anonymous recipes (MS A 91, item 14). The volume is bound in a dark-brown leather modern library binding. There are modern paper pastedowns and endpapers. The volume was purchased in 1941 by the Army Medical Library from A. S. Yahuda who acquired it from a dealer in Damascus, Syria (ELS 1700 Med. 31). Schullian/Sommer, Cat. of incun. & MSS., entry A91, p. 329), where the title is given as al-Wiqayah min al-amrad al-khatirah, and last element of author's name as Ibn Kinani. The well-known Jewish philosopher and physician Maimonides wrote a popular short Arabic essay on the topic of hemorrhoids. It was composed about 1187 at the request of an unidentified youth and consists of seven chapters (babs). The Arabic treatise is preserved today in a number of copies, and it also exists in Arabic copies written in Hebrew script (Judeo-Arabic). The medieval Hebrew translation is also preserved today. The NLM copy was made in North Africa in 1826/1241. For other copies, see GAL, vol. 1, p. 490 (645) no. 5; and Ullmann, Medizin, p. 168; and Savage-Smith, "Bodleian", MS Hunt 417 item 2. For an edition of the Judeo-Arabic text with German translation, see H. Kroner, "Die Haemorrhoiden in der Medicin des XII und XIII Jahrhunderts. An der Hand einer medicinischen Abhandlung des Maimonides über die Haemorrhoiden unter Zuziehung einer gleichnamigen medicinischen Abhandlung des Salomo bar Jussuf Ibn Ajjub, auf Grund von 8 unedierten Handschriften dargestellt und kritisch beleuchtet," Janus, vol. 16 (1911), pp. 441-456 and 645-718. The Hebrew version was edited by S. Munter, Birefuoth Hatechorim (Jerusalem: Mossad Harav Kook, 1965). The Hebrew edition was used as the basis for the English translation Treatise on haemorrhoids: Medical answers (responsa), trans. and ed. by Fred Rosner and Suessmann Munter [The Medical Writings of Moses Maimonides, vol. 3] (Philadelphia: Lippincott, ). The translation was revised after comparison with Kroner's edition of the Judeo-Arabic text and published as Maimonides' Medical Writings: Treatises on Poison, Hemorrhoids, Cohabitation, translated by Fred Rosner (Haifa, Israel: The Maimonides Research Institute, 1984, pp. 119-152). A project is ongoing to publish new editions and translations of all of his medical writings, to be published by Brigham Young University, Utah, in the monograph series "The Graeco-Arabic Sciences". 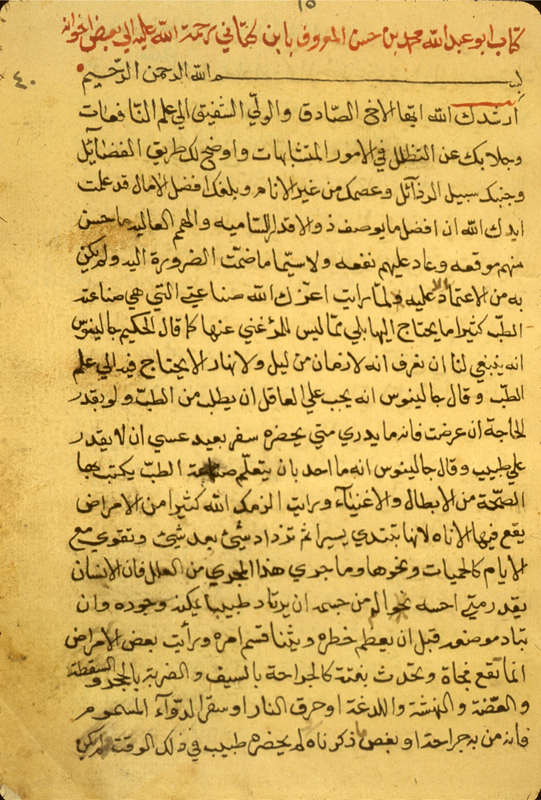 The opening of a short Arabic treatise on hemorrhoids (Risalah fi al-basawir) by Maimonides (d. 1204/601). The copy, in a Maghribi script made in North Africa, was made in 1826/1241 by a copyist named Maḥmūd ibn Muḥammad al-Ībī al-Ḥanafī. Arabic. 4 leaves (fols. 1b-4a). Dimensions 29.5 x 20.2 (text area 21.7 x 13) cm; 31 lines per page. The title Risālah fī al-bawāsīr is taken from other sources, for no formal title is given in this copy. The author is given on fol. 1b line 2 as Abū ‘Imrān Mūsá ibn ‘Ubayd Allāh al-Qurṭūbī. The copy is dated in the colophon (fol. 4a lines 19-20) where it is said that the copyist Maḥmūd ibn Muḥammad al-Ībī al-Ḥanafī completed the copy toward the end (fī awakir) of Rajab 1241 [= 11-21 March 1826]. Hamarneh reads the copyist's name as al-Alfi al-Hanafī (Hamarneh, "NLM", p. 98). A complete copy. The text is written in a medium-large North African (Maghribi) script, probably from the same workshop of copyists as produced NLM (MS A 85, item 3) (MS A 85, item 1) (MS A 85, item 5). The text area has been frame-ruled. The text is written in black ink with headings in red and blue-green and is set within frames of red and blue-green lines. There are catchwords. All the items in the volume appear to have been transcribed by the same copyist. On fols. 1a and 7a there are short titles added in a later hand saying that each is a Risālah fī ‘ilm al-ṭibb (A treatise on medicine); on fol. 1a the word aydan (also) is added, indicating that there were additional treatises bound with these items at one time. The cream, matte-finished paper is thick and opaque, with no visible laid lines or chain lines, although the paper is watermarked (visible, for example, on fol. 4). The volume consists of 18 leaves. Fols. 4b-6b, 17b and 18ab are blank. Fol. 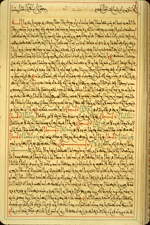 1a is blank except for title wa-hadhahi risālah aydan fi aī-ṭibb ("this also is an essay on medicine"). Item 1 (fols. 1b-4a) is the item here catalogued. Item 2 (fols. 7a-16b) is Kitāb al-Sard fī ‘ilāj al-dawābb wa-al-baqar wa-al-ghanam wa-adwiyatihā, possibly by Ḥunayn ibn Isḥāq (MS A 90, item 2); and item 3 (fol. 17a only) is a table of contents, Fihrist kitāb ma‘rifat al-furūsīyah, for an item not included in the volume (MS A 90, item 3). The volume is bound in dark brown leather over pasteboards with a blind stamped medallion on the front and back covers. There are plain paper pastedowns and endpapers. The volume was purchased in 1941 by the Army Medical Library presumably from A. S. Yahuda. No definite information is available regarding provenance. Schullian/Sommer, Cat. of incun. MSS., entry A90, p. 328. The Ottoman physician Muḥammad ibn Muḥammad al-Qawṣūnī was court physician to Sultan Sulayman I, who ruled from 1520 to 1566, and Selim II, who ruled from 1566 to 1574. 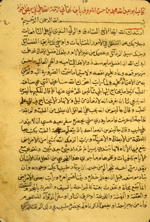 Al-Qawṣūnī's treatise on the treatment of hemorrhoids was addressed to travellers. It is divided into four chapters and an appendix. For other copies, see Ullmann, Medizin, p. 181 note 2. The beginning of a treatise on the treatment of hemorrhoids composed by al-Qawṣūnī. The copy was completed by an unnamed copyist on 8 Rabi‘ I 1081 [= 26 July 1670]. Arabic. 28 pages (pp. 77-105 [old 75-103]). Dimensions 21.1 x 15.1 (text area 16.8 x 11.0) cm; 21 lines per page. The title is given on p. 77 [old 75]. 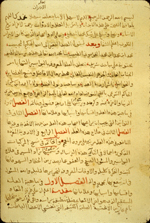 The author's name is given (p. 77 and p. 78 line 5) as Muḥammad ibn Muḥammad ibn Muḥammad al-Qawṣūnī al-tabib (the physician). The copy is dated in the colophon (p. 105 [old 103] line 20), where it is said that it was completed on 8 Rabi‘ I 1081 [= 26 July 1670]. The copyist is not named. The copyist does not appear to be identical with the one who completed the first item in the volume in 1648/1058. The ink and paper are similar, however. It is apparently a complete copy. The text is written in a medium-small naskh script using grey ink with headings in red. There are red numerals in the margins indicating chapters. There are catchwords. There are some marginalia throughout. Several recipes are written in different hands on the title page (p. 77 [old 75]). The volume has been paginated rather than foliated, and the most recent pagination replaces an older one in Arabic numerals still visible on the leaves. The volume consists of 220 pages and two preliminary pages. The volume has a recent pagination that replaces an older one using Arabic numerals. Page 220 [old 218] is blank. Item 1 (preliminary page 2, and pp 1-67 [old pp. 1-65]) is the Ṭibb al-fuqarā’ wa-al-masākīn by Ibn al-Jazzār (MS A 92, item 1); and item 2 (pp. 68-76 [old 66-74]) is an anonymous collection of recipes (MS A 92, item 2). Item 3 (pp. 77-105 [old 75-103]) is the item here catalogued; item 4 (pp. 106-116 [old 104-114]) is anonymous collection of mujarrabat recipes and procedures (MS A 92, item 4); and item 5 (pp. 117-219 [old 115-217]) consists of Nuzhat al-adhhān fī aṣlāḥ al-abdān by Dā’ūd ibn ‘Umar al-Anṭākī (MS A 92, item 5). Preliminary page 1 has talismanic miscellaneous notes and recipes written in later hands.